A Christmas tree quickly loses its purpose -- not to mention its needles. But a new class suggests you take that tree and turn it into cooking utensils. Or coat hooks. Or maybe a toy sword. The American Swedish Institute is offering a carving class Jan. 5 that uses, as its raw material, Christmas trees. 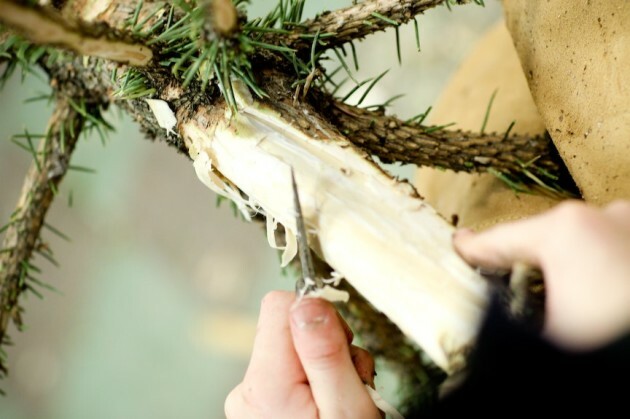 Its instructor, artist Josh Torkelson, came up with the idea while staring out at the institute's courtyard full of seasonally-trimmed trees and wondering: "What are some ways we could reuse these spruce trees, which like birch and others, are core to traditional craft?" Torkelson found old photos of wooden porridge whisks, made from the top of Christmas trees. One model features the final four branches at the spruce tree's top -- carved clean, bent back and bound with spruce root. "I have a Swedish speaker near me, so I'm going to ask her to say this word," Torkelson said by phone Wednesday, after teaching another class at the institute. "Grötkräkla." So he pitched the idea. Though the American Swedish Institute has plenty of trees, he's also giving participants the option of carving their own. "Having something made from your tree is so meaningful," he said. "People can make what they want and take the skills home," he said, maybe picking up a tree off the curb on their way.